Trianglen in Østerbro is a busy triangle-shaped public space immediately to the east of the new metro station and the south entrance to Fælledparken - the large public park in Østerbro. This is where two main roads in the city cross at an angle rather than at 90 degrees and it illustrates well how a dynamic townscape evolves over what is often centuries through a combination of factors including, of course, topography but also military and strategic history, wider patterns of roads and transport - so where people are travelling to or from either away from the city or within the city - and inevitably ownership and property boundaries and, in many cases, the direct involvement of a monarch, a city council and - from the 20th century onwards - planning authorities and transport companies. 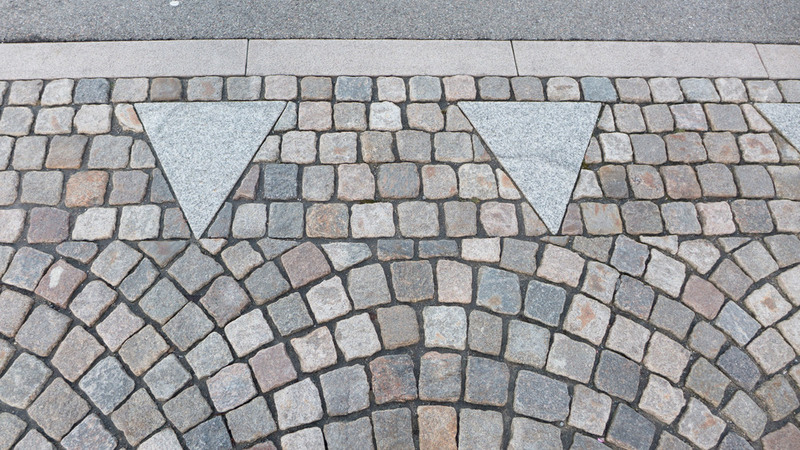 Oh … and as much as anything it’s often about the way people use a space or even how they cut across corners that over time ends up fixed in the position and line of roads, pavements and buildings. Through the 18th century this was a large area of open land outside the city walls and beyond the lakes but by the late 19th century new buildings had encroached on the open land, particularly along the south and east sides. Mayor Jens Jensen was the prime mover for protecting what remained of the open area for public use by creating a park here. The first trees were planted in 1909 and the park was completed by 1914 with Edvard Glæsel as the landscape architect in charge. A new bridge - the present Knippelsbro - was constructed and opened in 1937 with the designs by Kaj Gottlob. This has a much higher deck level - with long ramps up on either side to take road traffic up and over the harbour - so more shipping could pass through without opening the bridge - the current harbour ferries pass under the bridge without it having to open. There were two copper-clad towers - with that to the north for the main control room for opening and closing the centre span and a south tower contained sleeping accommodation for the bridge master and his men. 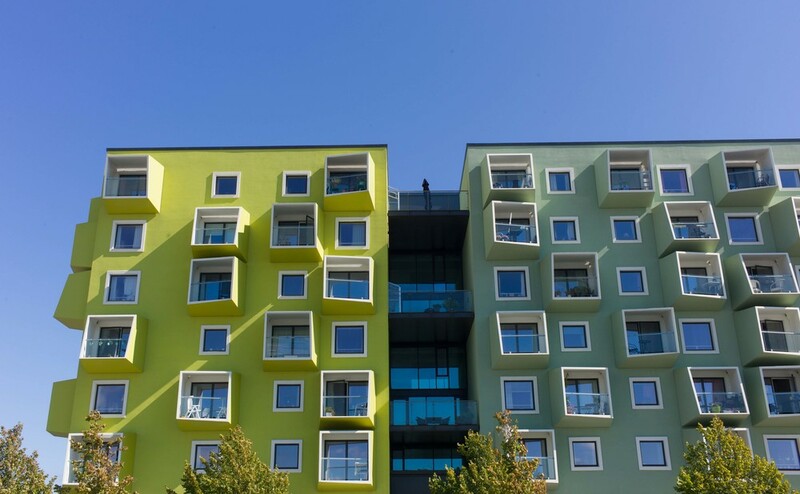 The apartment buildings at Bispebjerg Bakke were designed by the partnership of the Danish artist Bjørn Nørgaard with the architectural practice Boldsen & Holm. Although the apartments were completed in 2007, the initial idea went back many years before that to a conversation between Nørgaard and the chairman of the Association of Craftsmen so, from the start, an important aspect of the scheme was to have a strong link between an artistic concept and its execution with a very high level of craftsmanship. In the second half of the 19th century, as the city grew, Vesterbro was one of the first areas that developed outside the city ramparts with new houses, apartment buildings, shops and churches built on either side of the roads running out from the old west gate to the royal palace and gardens on the hill at Frederiksberg. Construction work spread south from Vesterbrogade and streets and small squares and building plots were laid out on either side of what is now Istedgade. Many of the apartment buildings date from the 1880s and 1890s although the blocks along the railway are later. Many were poorly built and were divided up into small apartments and lodgings. Because Vesterbro is such a densely built up residential area, green open space with grass and trees seems, somehow, much more important but when compared with other districts of Copenhagen, there appear to be few large open areas here. 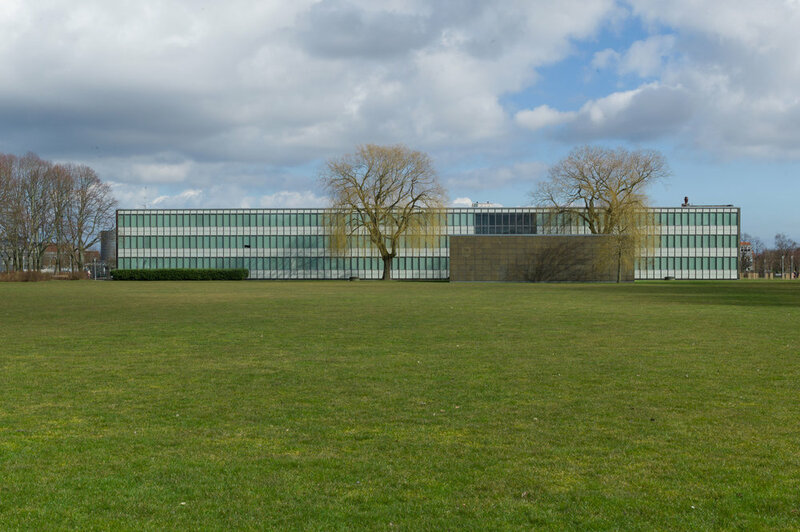 The most important open space is Skydebanen, a large rectangular park has the backs of apartment buildings on both sides so that in some ways it is more like a large courtyard. Its on the site of a private shooting range so presumably originally it was just grass or perhaps gravel but now has mature trees. At the south end It has been extended and opened out to the west but it still seems like a well-kept local secret, hidden away behind the apartment buildings and from the north entered through a narrow gateway beside a school and from the south, from Istedgade, approached through a doorway in a forbidding high blank brick wall that closes off a short street of apartment buildings. 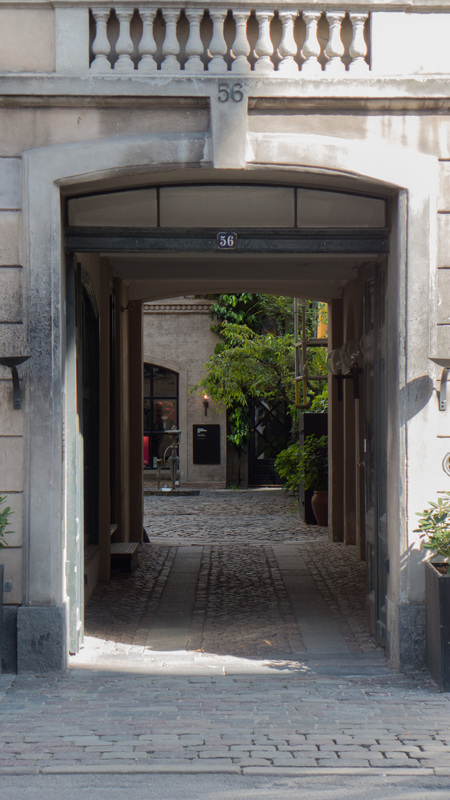 There is an impressive 18th century building onto Vesterbrogade, set back beyond a forecourt. Most people walking along the street would be hard pressed to guess what its function might have been although it was actually built in 1787 for the Royal Copenhagen Shooting Society. Until this summer it was the Museum of Copenhagen which has now closed pending a move to a building close to the City Hall. The shooting range itself was a broad strip of open ground behind the building that ran down to the sea shore and can be seen clearly on 19th century maps. Then, the south approach to the harbour was much wider and the sea shore was on the line of what is now Sønder Boulevard. First a railway into the city was constructed along the shore and then through the late 19th century more and more land and beyond was claimed from the sea and built over so the shooting gallery became rather cut off and in 1887 a large screen wall in brick was constructed across the south end of the gallery to prevent stray bullets injuring citizens on Istedgade. This is the screen wall that still stands at the end of a short street of houses with a gateway at the centre that now provides a partially-hidden access to the gardens and play area on the site of the shooting gallery. Vesterbro in 1879. Istedgade was still not continuous. The line of the brick screen wall can be seen but it was not constructed until 1887. The railway, marked as ‘Nedlagt Jernbane’ was still then on the line of what is now Sønder Boulevard and the first areas of new land out into the sound had been claimed and a new gasworks and the first buildings of the meat market constructed. 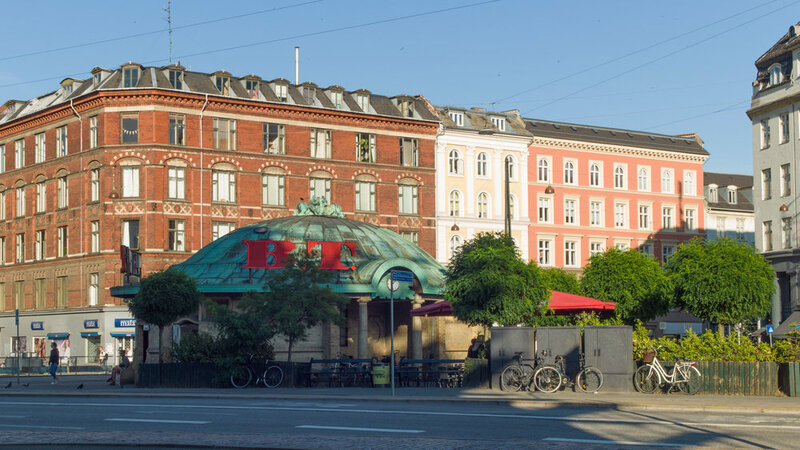 After the construction of the screen wall, work began on the Skydebanegade apartments that were built over the south part of the shooting range, on the south side of Istedgade and completed in 1893. Skydebanehaven is now an important green space in Vesterbro with a very popular playground for children at the south end. Several blocks of slum houses at the south end on the west side were demolished in the 1950s and 1960s as part of an extensive slum clearance programme and the space was opened up to link through to streets beyond. The space is open but not completely successful … the north part of the shooting gallery feels much more like a large Copenhagen courtyard but, at the south end, the space seem to leach out and break down on the west side creating odd chopped off rows of houses and odd views of the backs of houses that were not designed to be seen. Even so, this is an amazingly important and much used green space. There are four major areas for extensive new development in the city with one around the harbour to the north of the historic centre with the redevelopment of the old Free Port and the area of major docks beyond known as Nordhavn; a second area to the south on the west side of the inner harbour that includes Havneholmen, Telholmskanal and Teglvækshavnen; the third major distinct is an area on the east side of the harbour called Islands Brygge and finally there is Ørestad - a large linear development down the centre of the island of Amager that follows the south-west line of the metro from a relatively new university area, through the concert hall and television studios of DR Byen and on to the hotel and conference facilities of Bella Center and the end of the metro line at Vestamager station. The development of Tuborg Havn, north of Nordhaven, is a fifth area of major building work now nearly completed that includes apartments, offices for major banks and a shopping centre. Strictly this is not in Copenhagen but in the independent administrative area of Hellerup but it should be included for the quality of the buildings, for the overall planning, which is different from the other areas, and because it must mark the northern boundary of major building work in the region as one would hope that planners and local people would not want development to continue on to encroach on the important and very attractive coastal area of Charlottenlund and Klampenborg. The scale of new construction over the last 15 years can only be matched by the expansion of the city in the late 19th century when the old city walls were demolished and there was rapid building of apartments to the west and north of the old city. Between 1870 and 1900 the population of Copenhagen doubled from 181,000 to 360,000 people and housing had to be built for both new people coming into the city and for people already here but living in overcrowded slum housing that was cleared or improved. Obviously, in recent work, there are new office and commercial buildings and several new shopping centres but again, as in the 1880s and 1890s, it is the figures for new apartments that really are amazing. 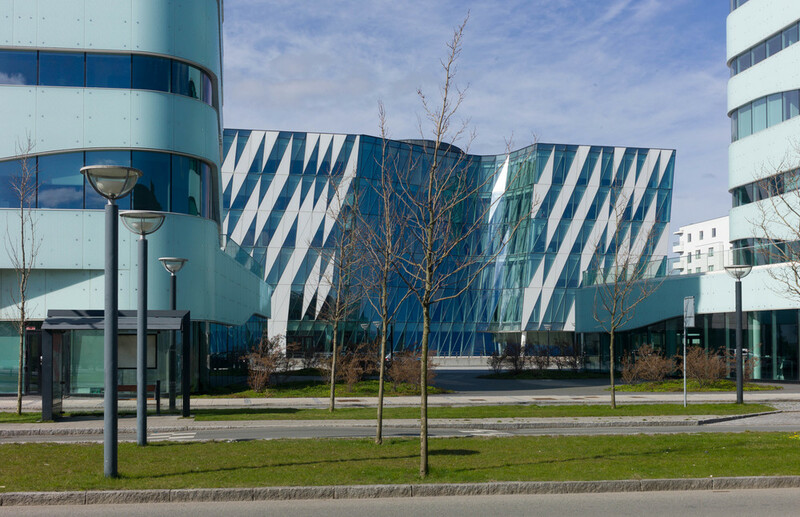 A recent newspaper article indicated that the long-term plan is for 9,000 new apartments around the South Harbour, 10,000 in Ørestad, 7,400 in Eastern Amager, 2,800 in Valby and 3,700 apartments along the Inner Harbour. Along with this housing there are major public buildings for culture, including the new Opera House, The Playhouse for the Royal Danish Theatre and major new concert halls. There are new squares, open nature areas, parks, sports facilities and of course, this being Copenhagen, new bridges for cyclists and new cycle routes linking everything together. As a crucial part of developing the city for the 21st century, there is also significant investment in infrastructure with a major extension of the metro system, new works for sewage and drainage and new buildings for waste recycling. Much of the new development is on land that was commercial docks, areas of heavy industry associated with the docks and even, in the case of the area of Holmen and the new Opera House, former naval bases and dock yards where the navy have moved away from the city centre. What is probably more important is that areas of reclaimed and marginal land and what is in many cities are functions or facilities that are shunned or hidden have been embraced in Copenhagen so one of the most exciting and prominent buildings under construction is the massive waste resource centre at Amager that, far from being hidden away, will be 90 metres high and will blow giant smoke rings. It is designed to be a family attraction as Copenhagen’s only ‘mountain’ and it will have a viewing platform, cafe’s, a climbing wall and ski runs down from the top. Finally, of course, new building in new areas of development has not meant that there has been a moratorium on work in the old city or in the more well-established suburbs. Planners and the port authority in the city are trying to avoid the major pitfall seen in rapid development in many cities where huge investment in one area means a mass exodus of businesses, up-market stores and more affluent families to areas that are seen to be more fashionable or more exclusive or simply novel. In Copenhagen there has been a concerted effort to make sure that areas are not abandoned or isolated … the rebuilding of the Nørreport station and with it the revitalisation of that area, the remodelling of Israels Plads, the revitalisation of the Meat Packing District and the chance to remodel the Vestebro area immediately west of the central station following major construction work for the extension of the metro are all examples of the city trying to ensure that no area is left behind. The fine Autumn weather and now the bright clear blue skies of Spring has been a good time for me to explore some of these areas and take photographs. I hope to cover many of these new buildings in more detail in future posts but the photographs here give just a brief introduction to some of the buildings in the city that have been completed since the turn of the century. Approaching Copenhagen from the north, down the main coast road through Hellerup, you enter the old city at Østerport station where the road divides … the road to the right, Store Kongensgade, runs in front of the historic and distinctive Nyboder housing scheme, and continues on to the main square at Kongens Nytorv and the road to the left, Grønningen, follows the western edge of the fortress, Kastellet, to the inner harbour, the royal palace and the grand 18th-century houses of Frederiksstaden. The roads form a very sharp triangle, now covered with grass and with just two statues and three trees, before they continue on either side of blocks of apartments dating from the late 19th and early 20th century. The first substantial apartment building, with a narrow but grand entrance front facing the triangle, is dated 1910 in bold numerals and is now owned by M Goldschmidt Holdings A/S. There is a short cross street in front of the building that is now cobbled but there are no pavements or pedestrian access along the long sides of the triangle. Basic elements of the hard landscaping here are determined by the form of paving in this part of the city with stone kerbs and pathways formed with two or three strips of relatively narrow rectangular paving stones set with their long side in the direction of the pathway and divided by lines of single square stone cobbles. There are wider bands of cobbles against the front of the buildings and bands or aprons of cobbles cut across the pavement to mark doorways and arches into courtyards. The elements are simple but are crucial to unify the appearance of the neighbourhood but all executed to the highest possible standard. On the triangle the cobbles in front of the entrance to the apartment are set in subtle curves forming scallops and there is a very careful attention to details ... so the line of triangles marking the stop line for traffic leaving the cross street to join the main roads, on most roads simply painted white, are here formed in large triangles of pale stone. From the north apex of the triangle to its base at the apartment building is 70 metres but in that distance the roads on either side drop down by over a metre. In the previous planting of this area, the south end of the triangle was banked up and densely planted. Now the central long axis is level, only dropping down with a low bank around the Titan sculpture to form a slight amphitheatre. This simple profile achieves much: when viewed from either pavement it means that the tarmac and the traffic on the roads has much less impact - both roads seem to drop rapidly away so that the impression is that the triangle of grass, when seen from the east pavement of Grønningen, forms an appropriate plinth or green setting for the important buildings of the Nyboder housing scheme on Store Kongensgade and when viewed from the west pavement, in front of those houses, the tarmac of Grønningen disappears and the grass of the triangle runs through visually into the greenery of the Kastellet embankments to form an appropriate backdrop to the Nielsen monument. The cars on these busy roads do not disappear but the impact of the wide expanse of tarmac is significantly reduced. Here the new urban landscape is elegant and, in a clever and subtle way, it enhances a much broader area - nearly every day I walk along these roads so I feel I can make that claim with justification. It illustrates the paradox that when a lot of thought and effort and money is invested in a project to get the design right, very few people comment; get the design wrong, cut corners, and people notice and criticise. One thing has certainly surprised me about my move to Denmark: when Danes realise that I am not just a visitor but have chosen to move my home here they seem genuinely surprised … the almost universal response has been “but why?” as if they really feel that there are better or at least more interesting places to live. As far as I can judge, this really is not a false or feigned modesty. When I go on to explain that I am here to write about architecture and design there is an even more curious and equally genuine and almost universal response which is to say that Denmark is not as wealthy and as comfortable as everyone else seems to think - for a start, I'm told, the Norwegians are certainly wealthier - and most then point out that Copenhagen had some terrible areas of slum housing in the early 20th century, even in the 1970s Copenhagen was, they tell me, rather gloomy and not prosperous and that there are still areas of poor or bad housing in the city. Again this is not false modesty but seems to be a genuine frustration about Denmark generally being written off as privileged or even complacent as a country. I have seen the photographs of Nyhavn in the 1960s when it was very much a part of the dock and lined with tattoo parlours and bars that would certainly not attract the tourists that flock to the area now and I have read about the overcrowded apartments, the dark inner courtyards off inner courtyards and the lack of sanitation in the housing in the city around the time of the First World War. In part, of course, poor quality and overcrowded housing was inevitable in a city that was growing rapidly, in terms of population, but with little land available then for expanding outwards. But what is also clear is that for centuries Denmark has tried to use good design and well-built architecture to enhance and improve the lives of ordinary people and this is most obvious in a number of large well-planned housing schemes to build good homes around the city. Some from a remarkably early date. The dark ochre-coloured houses are part of the Nyboder housing scheme with 600 houses on the west side of Kastellet for navy personnel. Building work started in 1631 (that is 1631 and not a typing mistake) and some of the single-storey rows from that period survive along Sankt Pouls Gade. The scheme was completed by 1758. There were small “cabbage gardens” between the rows of houses so families could stretch out their housekeeping budget by growing their own food. The king, Christian IV, realised that providing good housing meant sailors were likely to be more loyal in his service particularly as the housing seems to have been available to men after they were too old to serve and clearly the plan to encourage growing food meant that boys, potential recruits to the service, would be healthier and stronger. The houses with a pale grey upper storey are on the Brumleby Medical Association Scheme in the north part of the city just beyond the Sortedams Sø. These were built between 1853 and 1872 following an outbreak of cholera in the city and were for the “needy classes”. The scheme included a kindergarten, a bathhouse and a meeting hall. The brightly painted houses are in Olufsvej, a slightly later street immediately south of Brumleby. The houses that look similar to large Edwardian terraced houses in England are on the city side of Sortedams Sø. These are the Building Society Row Houses otherwise known as the “Potato Rows”. The 480 houses were built between 1873 and 1889 on the initiative of workers from the Burmeister & Wain’s shipyard who saved money in a building society and could win one of the houses in a lottery. The large houses were originally divided into apartments to accommodate more families. It is clear that socialism, or at least a clear understanding of social responsibility, is not simply a recent political phase of post war Denmark. What I am interested in is the large apartment blocks in the city that were constructed in the late 19th century and in the first decade of the 20th century. Through the summer I hope to explore the city archive for plans of these buildings and look at any documents about regulations and to look for information about the developers and architects who planned these blocks and the artisans who built them. The great apartments of Grønningen with 10 or 12 rooms and accommodation for servants are important to see how the rooms in middle-class homes were furnished and used but from a design perspective the small apartments for workers are just as interesting. Many of these apartments still provide amazing accommodation for the people of Copenhagen but equally they should provide a context and a starting point for the design of all the new apartments and housing schemes that are being built now. If I can make sense of the material and as I get to understand more and discover more as I walk the streets of the city, I will post my thoughts here. 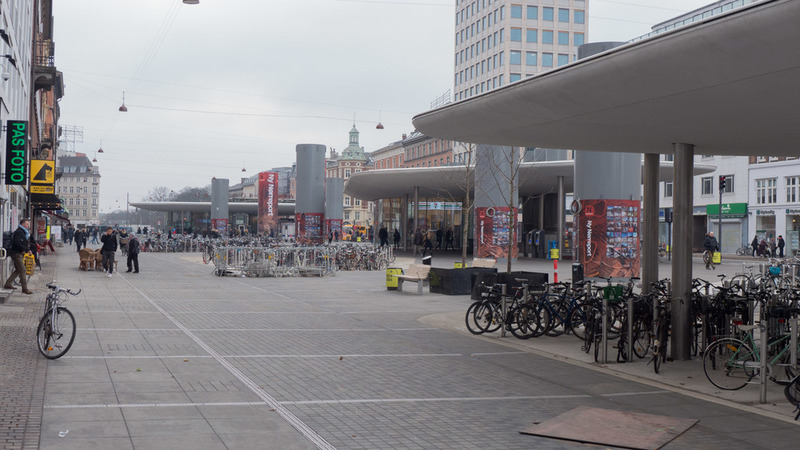 Engineering works for the major extension of the Metro in Copenhagen has meant that many streets and squares have been blocked or screened off with hoarding that are said to be in total 6 kilometres long and are, in places, 4 metres high. This has become almost a permanent part of the city streetscape and the work is not scheduled to be completed until 2018. 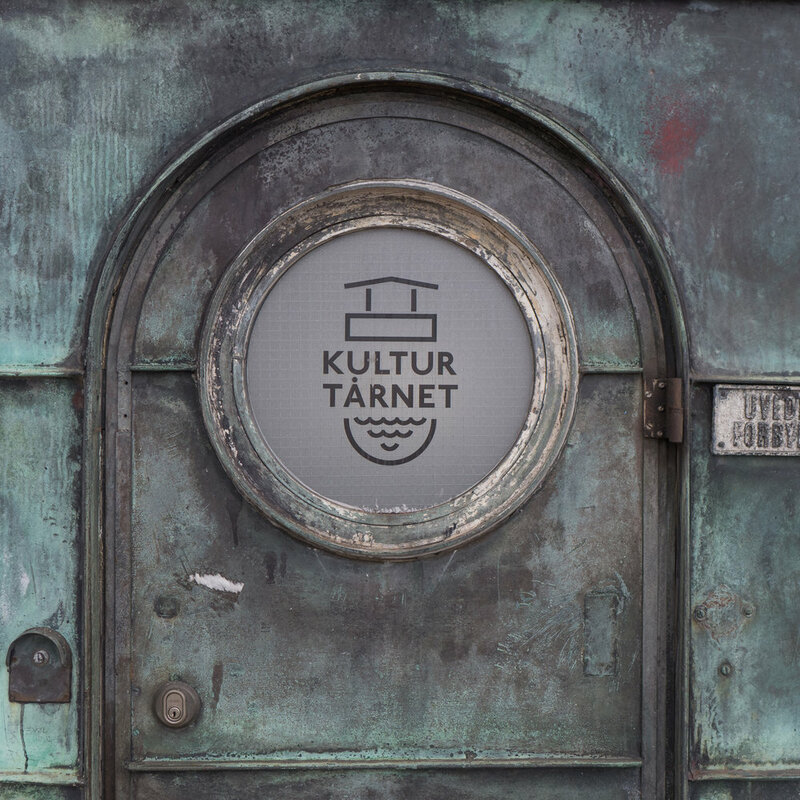 Metroselskabet, the company behind the project, came up with a scheme for artists and children in the city to use the hoardings as a canvas not only for street art but for communication and as a backdrop to installations. The citadel in Copenhagen, normally referred to as Kastellet, is a well-preserved, star-shaped fortress that was built in the 17th century to guard the approach to the harbour. It was well over a kilometre east of the east gate of the city with a clear view over the sound. Work started in 1626, in the reign of Christian IV, with the construction of St Anne’s Redoubt - Sankt Annæ Skanse - but work and ongoing alterations continued through to the 1660s, with major remodelling and improvements after the Swedish Army attacked the city in the war of 1658-60. The complex of defensive embankments, moats and military buildings were ostensibly complete by the 1720s in the arrangement that can still be seen today. Looking at maps of the city, one of the most striking features is the long line of narrow lakes that run in a gentle arc around the west side of the inner city and form a distinct break between the inner historic centre and the later areas of Østerbro, Nørrebro and Frederiksberg. There are three lakes - from the north end first Sortedams Sø, the longest lake divided into two parts by a road, then Peblinge Sø, the two lakes separated by the Dronning Louises Bro, and, at the south end, Sankt Jørgens Sø, again divided into two parts by a road. From the top end at Østerbrogade to Gammel Kongevej, below the level of the south lake, is just over three kilometres and the lakes, although they vary in width, are around 200 metres wide, from the inner edge to the outer shore, so this is a very large area of water. The lakes, initially spreading over a larger area and flanked by marshy ground, provided an outer defence to the city that was a physical barrier that any attacking army would have to cross and the water here also maintained the level in the outer moat of the defences. The lakes provided the city with a store of fresh water and water for irrigation. The earliest settlement appears to have been on a gentle slope running down to the shore and looking across to the large low island of Amager. With the density of building in the city now, it is difficult to appreciate the natural topography but clearly the lakes are in a slight hollow beyond the slope and the early town and are barely above sea level. Østerbrogade is at the highest point and then each lake is at a lower level until you reach Gammel Kongevej where the road itself is actually around a metre below the level of the surface of Sankt Jørgens Sø. Looking at the map there appears to be four bridges crossing the lakes although only the road at Dronning Louises Bro between Sortedams Sø and Peblinge Sø with its three central arches is actually a bridge with the water level the same on both sides. The other roads, Solvgade running across to Fredensgade, Gyldenløvesgade and Kampmannsgade are on dams. 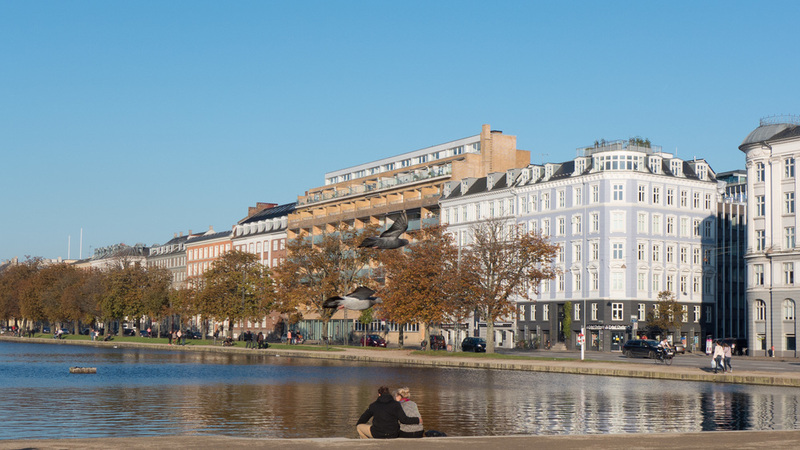 In fact Kampmannsgade has embankments on either side and the sloping road is actually well below the water level of the lakes on either side. The upper lakes have low stone retaining walls and gravel pathways forming an edge to the water but at Sankt Jørgens Sø there are natural grass banks with willows and reed beds but again these are man-made embankments and particularly on the outer shore the gardens and houses and apartments along Vodroffsvej are well below lake level. Historic maps show how the lakes have changed over the last four centuries and in the late 17th century and through into the 18th century the lower lakes had a much more irregular outline and covered a much wider area indicating the natural contours of the underlying topography. In fact the map of 1674 shows a lake north of Østerbrogade and a simple dyke between that lake and the sea and, at the south end, lakes or marsh continuing round to Køge bay so at that time the city was surrounded by water. By 1705 the moats and embankments of the defences encircled the city and there were regulations to restrict buildings beyond although there were outer defences beyond the lakes. By the late 18th century there were roads beyond the lakes with some houses with gardens running down to the far shore of the lakes. By 1860, shortly before most of the moats and defensive embankments were removed, the lakes were close to their present extent and shape. Now the lakes are an important resource. They provide a strong sense of clearly-protected open space, with wild life - Fugleøen, the island on the outer edge of the northern lake, has a breeding colony of cormorants and there are nesting swans on the lower lake. Thousands of people live in the apartments and houses overlooking the lakes and the lakes are a major resource used for leisure and for people walking and running. In 2009, the architectural practice Gottlieb Paludan and the architectural cooperative COBE won a competition for a major project at Nørreport, to upgrade the railway station and the metro station and to remodel the area around the station. Construction work started in 2012 and the new station was inaugurated on 10 January 2015. Main structural work and the main elements of the hard landscape - paving for large new pedestrian areas, with places for leaving bikes and large new canopies covering parts of the street - are all in place although some work is still to be finished on some of the ventilation columns and the paving around the secondary stairs to get down to the platforms. It has taken a long time to get this far but the project has been incredibly complicated, not least because the traffic hub here is the busiest in Denmark with around 250,000 passengers passing through each day and the stations had to remain open through all the works. Suburban lines stop here with trains every few minutes and the Öresundståg - the inter-city trains that run between Helsingør and Helsingborg in Sweden by way of Copenhagen central station, Copenhagen airport, across the Øresund Bridge to Malmö and on to Lund and Helsingborg - run at least every twenty minutes and at peak times there are six trains an hour in each direction. All those trains follow the line of the main street but are just below the surface in a cut so all the platforms are below ground. Then below the railway station, is a metro station with the tracks and the platforms running across the line of the street with the metro trains every few minutes and, to add to the daunting job of planning the construction work, Nørreport is also a busy bus interchange. Curiously, when you are standing in the middle of the station, it is quite difficult to judge just how large an area the station covers, partly because of the press of people, but from the air photograph you can see that at ground level it runs for three blocks - over 400 metres - between the corner of Ørstedsparken - the park and lake are at the bottom left corner of the photo - and the south corner of the Botanical Gardens. There were three main parts to the scheme: first to reorganise completely the urban space at ground level; second to renovate the platforms which were grim, to put it politely, and, third, to overhaul the bridge construction carrying the square and street over the rail tracks which involved major engineering works. Only the position of steps down to the train platforms and then on down to the metro platforms have been kept in the same position but virtually everything else has changed. A detailed study of the flow of pedestrians into, out of and through the station area was completed and this determined the location of canopies and the main structures to keep these main pedestrian pathways as free as possible. To make building work even more difficult the area is crossed by major bike routes in and out of the city centre and is an important and increasingly important tourist hub with visitors heading to or moving on from the National Gallery, Rosenborg Castle, the Botanic Gardens and the Worker’s Museum. Add to this the growing popularity of the food halls at Torvehallerne and possible events at the recently remodelled Israels Plads, both a block west of the station, along with the recent announcement that the Geology Museum at the far corner of the Botanic Gardens is to be part of a major development to create a new National Museum of Natural History and you can see that the figure of 250,000 people a day coming through the station can only increase and probably pretty quickly. Oh yes, and add that Fredrikborggade, the main street running down from the station, is the start of Købmagergade, a major shopping street running down to Strøget, the Walking Street, and it is no exaggeration to say that on Saturdays here I have seen more people pressed together than at major football matches - and for a year I lived within sight and sound of the Manchester United ground. In the original arrangement of the area, the wide main street, Nørre Voldgade, had heavy road traffic passing through on both sides of a central island with the main station entrances on the island so nearly everyone, on emerging from the station, had to then cross a busy road. There is now less use of private cars in the inner-city and journeys by car will probably reduce even more when a major extension of the metro opens so road traffic along Nørre Voldgade has now been pulled back to just one side of the space, the outer side of the road on the side away from the city centre. The majority of travellers, particularly commuters heading into the city, will come out of the station on the pedestrian side and from there head down pedestrianised streets. Clearly the plan for the area also had to focus on the needs of cyclists - many journeys in Copenhagen combine train and bike with people either travelling with a bike on the train or leaving a bike at the station to complete the last part of the journey. Racks have been created for 2,500 bikes to be left here in areas set down in hollows 30 cm or 40 cm below the level of the pavement. These clearly mark out the bike areas and segregates bikes and pedestrians … the idea is that it should help stop bikes being left against any and every post or bin available but equally should discourage people from pushing through these areas and damaging bikes. The canopies over certain areas give some protection from the weather but they are set up high and the pavilions for shops and food stalls below the canopies are primarily glass and with curved walls so there are plenty of views through and across the space. This is partly for safety - with so many people here at all times of the day and into the evening and night any dark areas or corners would not have been a good idea - but also it will help people orientate themselves quickly. Commuters coming through every day know exactly where they are going and go there fast but as a visitor it is impossible, even if you try, to keep yourself orientated as you change through several directions underground and then emerge into light and the bustle of crowds. So people tend to stand in the middle of pathways looking around or looking at maps. It will be interesting to see how signs and so on will be organised but the space, the light and the careful study of the busiest patterns of movement, to keep those free of structures and street furniture, should mean that people will head for where they are going quite quickly and clear the area. Although, having said that, paving over a larger area of what was roadway and keeping through traffic to one side will almost certainly encourage street cafes and other attractions to establish themselves here. When the bastions and earthworks were still in place, the road immediately inside the defences was wide and kept free so that soldiers could move around quickly if the city was under attack. When the earthworks came down in the 1870s and streets, squares and apartment buildings were laid out in the area over and beyond the earthworks, that inner road was left as a wide boulevard - Nørre Voldgade - so it has always been seen as a sort of ring road. Certainly with the increase in private cars in the 1950s and 1960s it became an extremely busy inner ring road. For me, as a historian, what is interesting is that Nørreport is not the only major transport interchange that is being drastically and extensively rebuilt. Major work is currently in hand at both Kongens Nytorv, to extend the metro station there, and at the north end of the square in front of the city hall for a new metro station there. These will be the three most important points of access to the inner city … which is really quite appropriate as these correspond exactly with the three major medieval city gates. Nørreport, as the name implies, was the north gate, Kongens Nytorv is immediately outside the east gate and Radhuspladsen, the city hall square, is immediately next to the site of the old west gate. Presumably medieval ghosts do not need to travel by metro but once they get to any of the three old gates then finding their way into the city would not be that difficult: the buildings may have changed but not the basic layout of the streets. After the demolition of the old city walls in the late 19th century there was rapid development of the area between the old part of the city and the line of lakes to the west. Wide new streets were laid out with large new apartment buildings and with a number of squares including a greengrocer’s market, Grønttorvet, that was established in 1889 just beyond the old north gate. The market on the square survived until 1958. The south half of the square, linking the space with Ørsted Park, is now almost complete with paving, a low stepped ziggurat over the exit from an underground car park, a shallow canal (still to be filled with water) and a sports area. There is a similar triangle of steps at the north-east corner of the square that is popular as an area to sit in the sun and presumably both sets of steps can be used as seating for performances in the square.